Don't let the picture deceive you - this is a big bag and holds your critical supplies and tools. The size is: 17"x10"x7", This bag opens up wide to show you all supplies (no digging around in a dark bag) and features lots of meshenclosures, elastic straps to hold tools and more. Bag has a Star of Life emblem on the outside and is available inOrange or Royal Blue. Meshhandles. Need supplies? 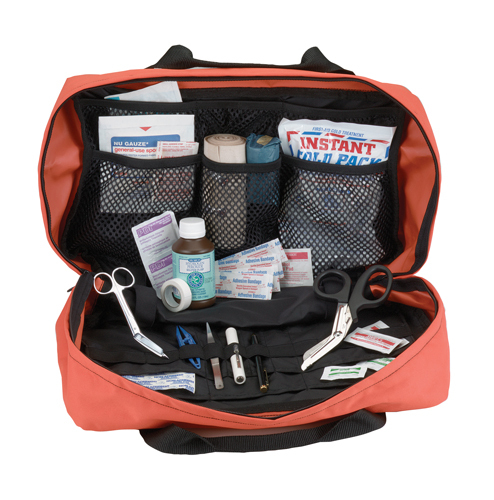 Don't forget to check out our refill section and medical toolsarea to build your kit or fill it back up your emergency first aid supplies after use.